The Alla High School in Northwest Collin County, is in many ways unique as a public school. It was founded by the late Dr. Moses Hubbard, who was born in Virginia, July 31, 1827 and wife as a memorial to their only child, Mrs. Alla Spencer, wife of Dr. B. F. Spencer of Weston. When death robbed them of their child their hearts turned to children of their friends and neighbors. There seemed no more fitting to honor her memory than to use their wealth in an educational way. It was their will that their property be divided into two funds. One was to be a permanent fund and was not to be lessened or diminished in any manner for any purpose. The other fund was to be the available und and may be expended, used and applied. It was their desire that the trustees of their estate, who manage it and are self-elect, use the available fund in the employment of teachers and the erection of proper and necessary buildings. The first board named by Dr. Hubbard, consisted of the following men: Dan P. English, J. H. L. C. English, Dr. B. Spencer, F. S. Finley and the county superintendent at that time. It was in the spring of 1896, work was begun on the first building of the Alla school. It was a two-story, wooden building constructed by Ben and Willie O'Brien. In the first story were two large classrooms and a hall. The upper story housed the Masonic lodge for several years. The location chosen was the site of the early home of this pioneer family. The two school districts, Emerson-one mile west of Alla, and McWhirter-one mile east, were merged into the Alla district. When the public money was expended, funds from the estate extended the time to an eight month term instead of the usual six month term. The first term of school opened the first Monday in October in the year, 1896. Professor and Mrs. J. W. Miller were the instructors for the first term. Later, the third teacher was added who was Miss Lula Cunningham. In 1897 the Emerson building was moved on the campus. At first there was no age limit. Tuition was free to all ages. The curriculum was rather broad but about 1908, A. L. Dyer adopted a formal course of study and the school has since used the state course of study. The first graduating class under this course consisted of: David Styles, Ollie Finley and Hubbard Finley. In 1923 the school which now stands was built. 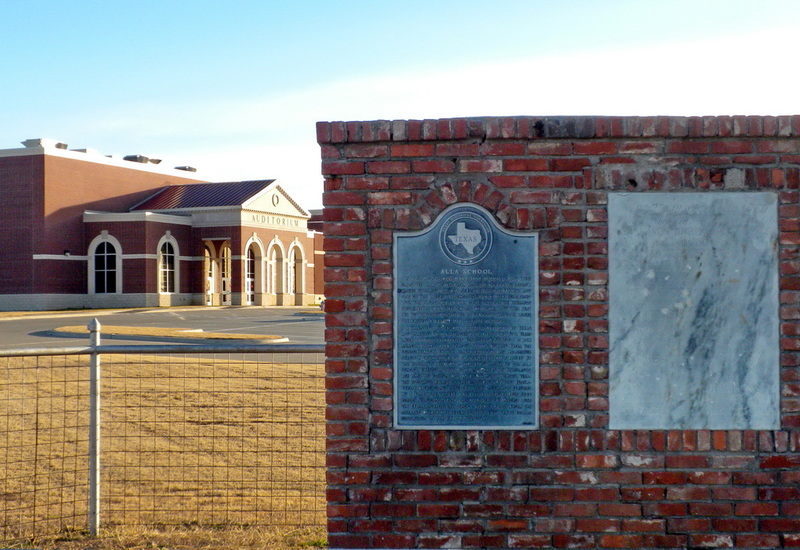 It is a brick construction which is now stuccoed white, and it stands a quarter of a mile southeast of highway 289. For a time there were only ten grades and in 1936, under the supervision of T. W. Hammer, the 11 grade was added. In 1941 Alla became and affiliated school. In that same year, Builderback and Shaine Chapel districts decided by popular vote to consolidate with Alla for a better school and richer community life. School has begun this year with Mr. Miles Murphy as superintendent. SHE EARNED A DEGREE IN LITERATURE IN 1880. AGE LIMIT, NO TUITION, AND AN EIGHT-MONTH SCHOOL TERM. EDUCATION IN THE CELINA SCHOOLS. Plaque next to the historical marker reads: This building was erected through the munificence of Dr. Moses Hubbard and wife Mary Jane Hubbard. In memory of their daughter Alla by J. H. L. C. English, F. S. Finley, J. T. Robinson, A. V. Rogers, Trustees of the estate; J. W. Moseley, Co. Supt. ; W. A. Tackett, architect; J. E. Harris & son, contractors. Founded 1896. Erected 1923. Celina High School in the background.